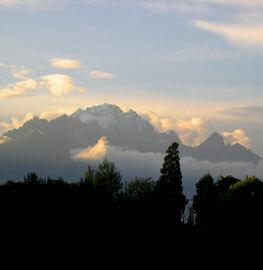 Click here for photos of our apartment, Kunming page one, and Kunming page three (regarding the Flying Tigers and the Burma Road). The next five photos are from the International Horticultural Expo in the NE part of the city. 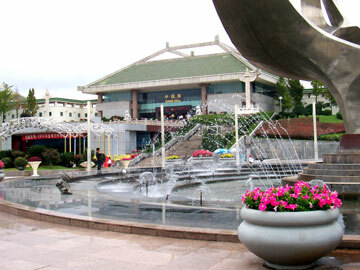 This is huge indoor and outdoor complex featuring flowers and plants, but it also has outdoor exhibits representing each of China's provinces, as well as an international area with exhibits representative of many nations. We thoroughly enjoyed our visit, which a rain shower cut far too short. 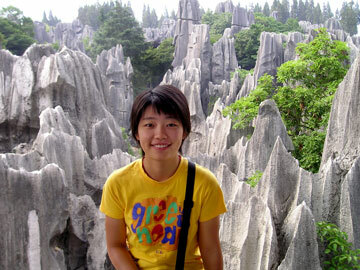 But we have gone back twice to take visitors to enjoy the scenery. This fountain is near the main greenhouse/floral hall. 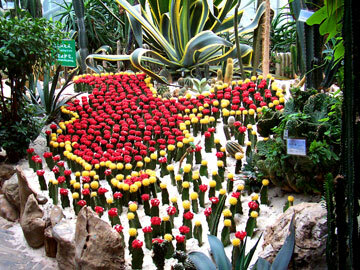 These flowering cacti are arranged in the shape of China! 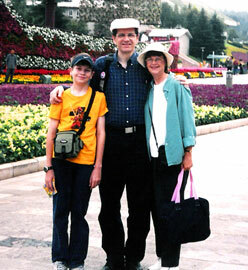 Vivian, Michael and Andrew stand in front of a floral ship, "sailing" on a sea of flowers (2006). 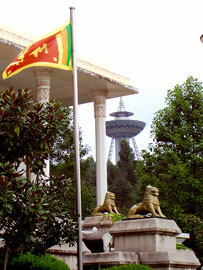 Sri Lanka is one of many nations represented in the international area. 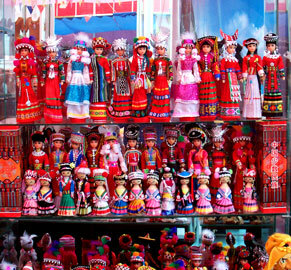 (right) Colorful dolls were on sale, representing China's ethnic minorities--many of which have villages in Yunnan Province. This montage is from the National Minorities Theme Park, where you can hear and see native dances, buildings, music, costumes, and more. Then take a cable car from the theme park's back gate up West Hill (you can see West Hill behind the panoramic shot below) for a great view of Kunming and Dian Chi (Lake). This is another favorite place to take visitors. Andrew's former Chinese tutor in Xi'an (Linda, pictured in the middle) gave us these photos from her visit to Yunnan Province. Yunnan is well known for its variety of national minorities (left), the Stone Forest (center), and its beautiful mountains and rivers (I believe the final picture is Yu-long Jade Mountain in Lijiang). 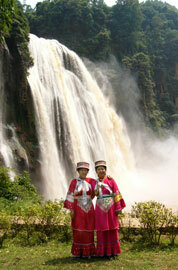 Yunnan is truly a remarkably beautiful place!